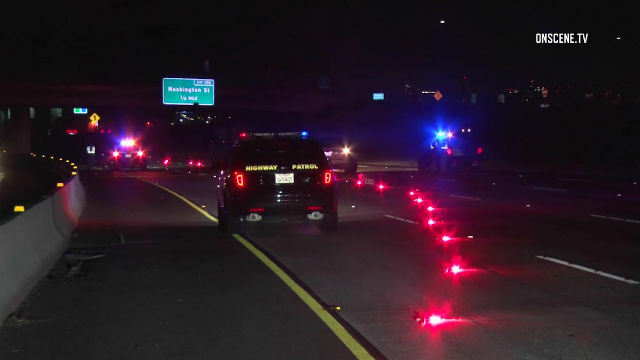 A Riverside County man was behind bars Tuesday for allegedly fleeing after his car struck and killed a pedestrian last weekend on Interstate 5 near Old Town. Corundolus Toussaint, 38, turned himself in to San Diego police Monday evening and was arrested on suspicion of hit-and-run in connection with the traffic fatality just north of Lindbergh Field, according to the California Highway Patrol. Toussaint allegedly drove off after his blue 2004 Honda Accord struck 21-year-old Andres Perkins on the southbound side of the freeway about 2:45 a.m. Saturday. Perkins, who may have subsequently been struck by another vehicle, died at the scene. It was unclear why the Menifee resident had gotten onto the freeway on foot, CHP public affairs Officer Jake Sanchez said. The damaged Honda — which lost a bumper and a license plate at the site of the crash — was found abandoned at a gas station on Pacific Highway. Toussaint, a resident of Perris, was being held at San Diego Central Jail on $50,000 bail pending arraignment, scheduled for Thursday afternoon.